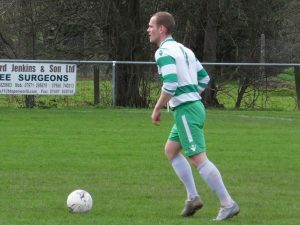 The fist team beat their bogey side of recent years Abermule FC 3-0 with striker Matty Tong netting a hat-trick. This was my first visit to Forest Road for about a month when I watched the border club’s ladies’ team entertain Ludlow Town in the semi-finals of the Herefordshire FA Women’s Challenge Cup under the floodlights. 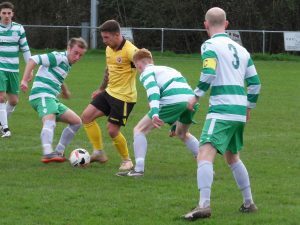 I had previously watched the men’s first team on a couple of occasions at the end of February, when they visited Four Crosses and recently-crowned champions Montgomery Town, with both matches concluding in defeat for the Saints and effectively ending their own title ambitions. 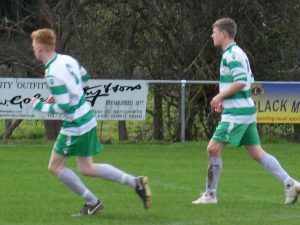 Hay St Mary’s came into this afternoon’s fixture still in second place in the MMP with Norman Lloyd Mid Wales League Second Division table despite having seen their last two fixture postponed due to waterlogged pitches. 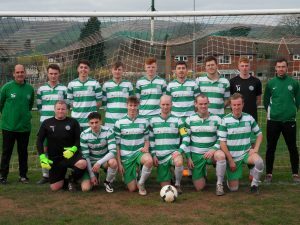 The Breconshire club’s last outing was some three weeks ago when they enjoyed a 6-2 home victory over Waterloo Rovers to virtually end the Welshpool outfit’s own promotion hopes. 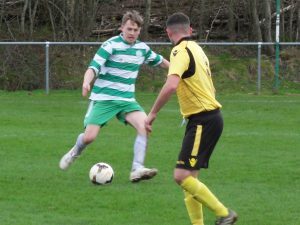 Abermule found themselves just below the halfway point in the Second Division table but had lost their previous fixture 4-2 at Borth United a fortnight ago. Although the Montgomeryshire club have become somewhat of a bogey club for Hay St Mary’s over the past 12 months. 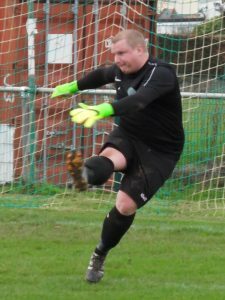 Mule won the corresponding fixture last season, before enjoying victory in the home league encounter back in September and then recorded a penalty shoot-out victory over the Saints at Forest Road in the E R Jenkins Cup in early November. 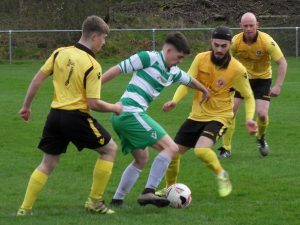 The hosts knew that victory was imperative this afternoon to maintain their promotion drive as Four Crosses, who were due to visit mid-table Borth United this afternoon, remained hot on their heels with three matches in hand on the Saints. 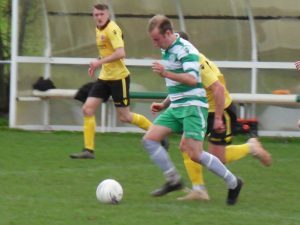 The home team made the perfect start to the afternoon when Matty Tong latched on to a seventh minute though ball and calmly guided the ball past the Abermule goalkeeper. 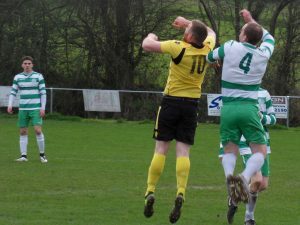 The visitors had a good opportunity to equalise only three minutes later but volleyed over the crossbar from close range when a deep free-kick was pumped into Tom Bevan’s penalty area. Despite that close call, the Saints doubled their advantage in the 17th minute following by good work by Greg Preece on the byline to find Matty Tong, who feinted a couple of times before finding the corner of the net with a quality finish. Bevan was forced to parry a low shot from the edge of the penalty area seven minutes later before pushing the ball behind for a corner as the Abermule forwards looked to pounce on the loose ball. Tong saw his fierce drive turned behind the near post for a 26th minute corner before Bevan punched a deep Abermule free-kick just a couple of minutes later and was relieved to see the follow-up shot put wide of his goal. 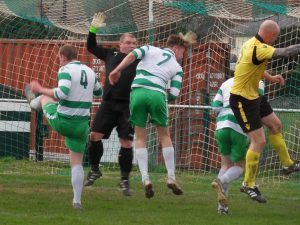 Greg Preece saw his low shot from the edge of the penalty area turned behind for a corner bu the visiting custodian on the half-hour mark before Abermule broke down the left five minutes later and saw a shot easily saved by Bevan following a cross into the penalty area. 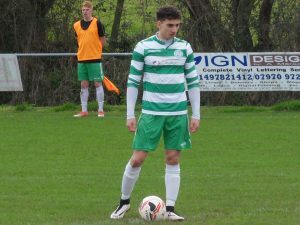 The Montgomeryshire men made a strong start to the second-half and forced Bevan to make a smart savve in the opening minute after breaking quickly from their own half. The Saints extended their lead 13 minutes after the interval, following good work by Brendan Hackett on the left side of the penalty area, as he picked out Tong and the striker duly completed his hat-trick. Jack Biggs had a great opportunity to net a fourth goal on the hour mark when Jack Biggs was played in on goal but was denied by a combination of the Abermule custodian and his defence. 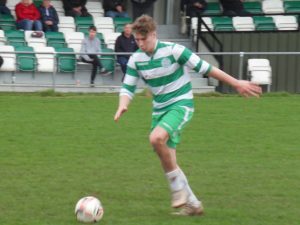 The experienced Abermule striker Dave Anthony struck a 25 yard effort at Bevan before the visitors broke clear in the 74th minute but Bevan was alive to an attempted chip. 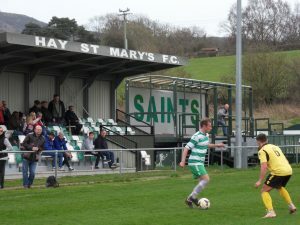 Hay St Mary’s placed further pressure on the visitor’s goal in the closing stages as the Abermule players tired without having an substitutes to bring on to the pitch. 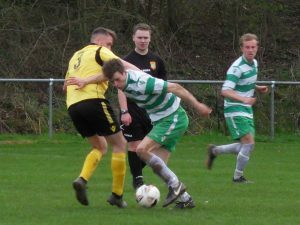 Anthony latched on to an 88th minute through ball but fired wide of goal under pressure from the Saints’ defence. Tong nearly scored a fourth in the final minute of the match, following good work by strike partner Preece to find him, but saw the attempted lob drift narrowly wide of the far post. Many thanks to loyal supporter Glyn Collins for sponsoning the game.